Former Henry H. Gage house, located at the northwest corner of Chestnut and Sheridan Road, was built about 1873. The building, converted to a restaurant, was damaged by the tornado that struck Wilmette in 1920. It was razed in 1944. 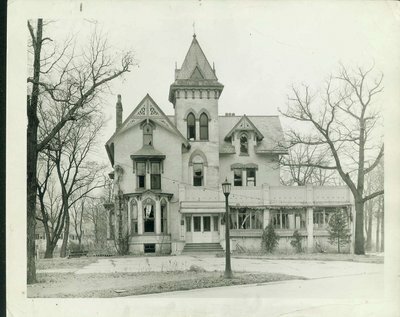 In pencil on reverse: "Old Gage home at northwest corner of Chestnut and Sheridan Road, pix April 1944 just before the house was razed. Called "Tornado Tavern."